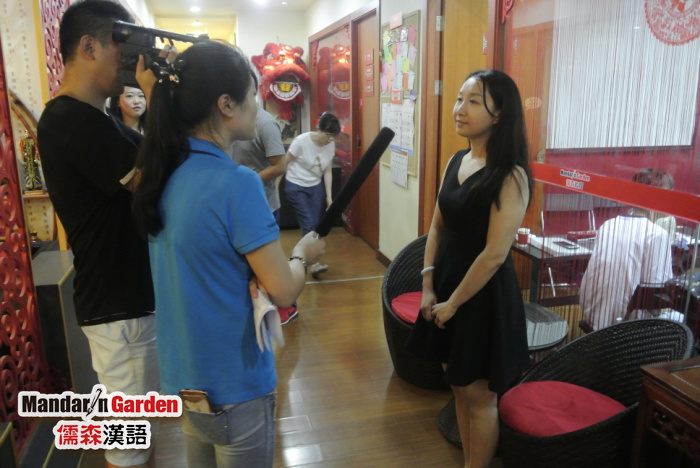 Nowadays,more and more foreigners come to China,seeking for new opportunities,which is relevant with the extended influence of Chinese language.This summer,the Chinese training lessons has been commenced actively in Mandarin Garden as usual. On the afternoon of 11th,July,the experts from the Commerce Department of Jilin Province, with the journalists from Jilin TV,came to the Mandarin Garden Shanghai Center.Warm welcome to the distinguished guests was expressed by Tiffane, the CEO of Mandarin Garden. 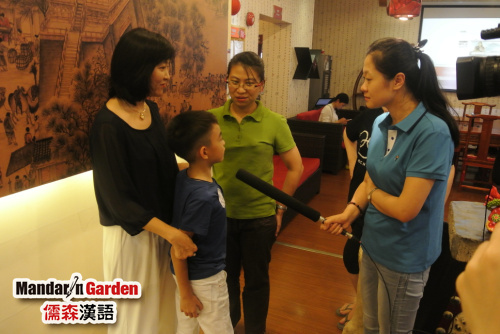 During the interview,Tiffane said that Mandarin Garden was set up in Shanghai,and the school has developed into many branches,distributed in six cities including Changchun over the mainland.After the development of 8 years,she was thrilled and honored to have the interview from her hometown Jilin,she also said that,’establishing the Changchun branch is to promote the Chinese training industry for the foreigners in my hometown with the help of Shanghai center,and provide the young generation with more employment opportunities,thus,I can do my bit to the society.’Tiffane also presented the teaching method ’teach 15 Chinese characters with one picture’ by herself to the inspection group. The week when the inspection group arrived was just the second week of Pre-job training,and the teachers who have already got the IPA certificate was receiving the advanced training of teaching methods.With getting to know them,the teachers in the training class differ from each other,some are the college students in the internship,some are the people who didn’t get the IPA before but had the experience of teaching Chinese overseas,others are the Taiwan compatriots who want to be the Chinese teachers for foreigners and love the traditional Chinese culture.After the further conversation with them,the inspection group had known the reserve faculty in Mandarin Garden better. The inspection group had deeply investigated the teaching model,teaching philosophy,teaching arrangement and other aspects.The teachers training and development program and the three-in-one diversified teaching system were introduces by the teacher Peach,the manager Linda and the manager Martin. Next: A happy,safe,and meaningful summer camp is waiting for you!